When you read the title of this article you will probably think that this module has all that you need for the development stage of your magento project. Once again, you are wrong. I was thinking of somenthing that can be useful to me and speed up some common actions in development stage and I think that this module can be helpful, especially for those who works on “live” server and need to test some new features they have developed. Module is actually a switch between two admin controllers and you can use it quickly and easily by selecting action from dropdown menu “Production mode” and “Development mode”. I am developing a small product and main feature is Notification. So to start found ready code to integrate with GCM and its working fine but want to send to notify all Registered Ids one by one record and also other module to send in Bulk. Above feature want to add in Magento Admin panel as Module. Please help to here as I am not a pure coder so getting many difficulties to complete it. > Once again, you are wrong. Sorry guys, colours fixed. Thanks for the feedback. Thank you for download link above. Where is the inchoo-developers-module downloadable ? Any chance of making this a git repo so we can all hack on it? I’ve been planning on doing something like this myself … Wanted to include FirePHP being enabled, change PayPal API settings to sandbox mode, etc. Love to help with it. Good to see more tools that help with magento development. You can also use MageTool http://bit.ly/dYSse5 to do all of these, and more, from the command line, e.g. but the module is it’s firts version and I also announced new features which need to be implemented. For some time I plan to upgrade it with mentioned features which need testing also. Once we feel that the module will contribute to the community with full set of features it will definitely go to Connect. All suggestions and critics are welcome. Always good to see tools to help people wrestle with The Beast. Any chance of submitting this to Connect? As usual this is great module. Always waiting for next post in inchoo. 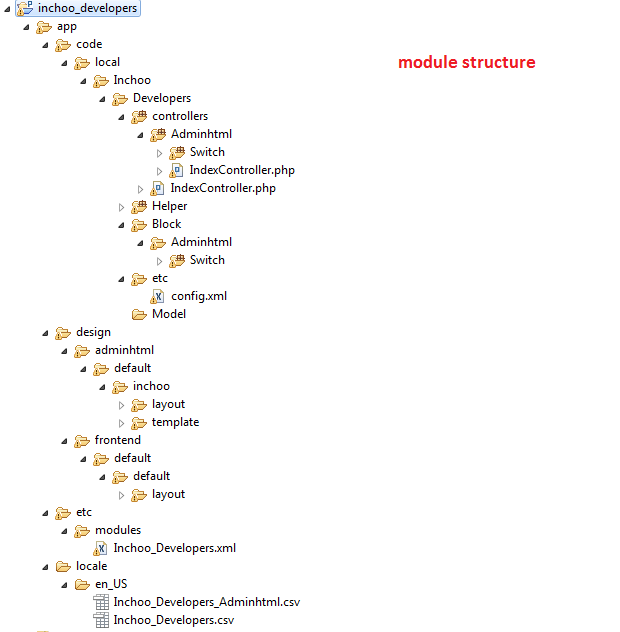 This may be useful to see structure for how to create admin module in magento.